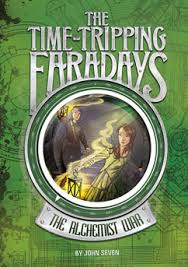 But in any event, today I read a brand new one, nominated for the Cybils--The Alchemist War, by John Seven (Stone Arch Books, 2013), first in the Time-Tripping Faradays series. I want to start by commenting on how tremendously appealing I find the cover, with its combination of understated but appealing protagonists in a Mysterious Setting and its historically-sciencey background. The marketing isn't skewed to either gender, which is nicely in keeping with the book itself, in which a brother/sister team share the limelight. It's also a small book, which makes a pleasant change from the door-stoppers so common in Middle Grade fantasy, and which I think adds to it's kid appeal--it looks a bit like a geek notebook. The Alchemist War tells of two kids (brother and sister Dawk and Hype) from a far future earth where time travel is part of the high tech way of life. The Faradays are a time-travelling family, sent on various missions to fill in gaps in the history databases. When Dawk decides to see if elephants really are afraid of mice, while observing Hannibal crossing the Alps, the unfortunate consequences result in the Faradays being given a much less prestigious assignment--studying footware in 17th-century Prague. But Dawk and Hype, and their guard robot (there to keep them out of more mischief), stumble into a much more interesting time travel adventure when they become, almost without trying, the quasi-apprentices of a somewhat dodgy alchemist, and stumble upon hidden technology that has no place in the past. This is a book that's best suited to the younger end of middle grade--the third and fourth graders who very much enjoyed the Magic Tree House books will feel themselves on firm ground, though with the new twist of futuristic technology. Much older than that, and there won't be enough complexity of plot or character to hold the reader's interest. The bulk of the world-building happens in a somewhat ungraceful info-dump, and the presence of the somewhat feeble parents doesn't add much, but once the Faradays head to Prague, the story becomes more cohesive and interesting. That being said, it never quite delivers regarding the titular promise of an "alchemist war," nor is the story developed much beyond its bare bones (there's lots that not clearly explained or explored, which might disappoint the more experienced reader of fantasy). And likewise, the past--its places, people, customs, etc.--is not described richly enough to make the reader truly feel that she's travelled back in time. I kind of had to take it on faith. (Although in fairness the food of the past was nicely contrasted the food of future). In short, its a perfectly reasonable book to offer older elementary school kids, with a great cover! But not so much one for the grown-ups. disclaimer: review copy gratefully received from the publisher for Cybils consideration.